Last year’s gardening was stressed bc no matter how much I watered, it was never enough and the plants suffered. I checked out drip irrigation systems this spring, but every system I looked at was either unattractive or over complicated for my small plot. 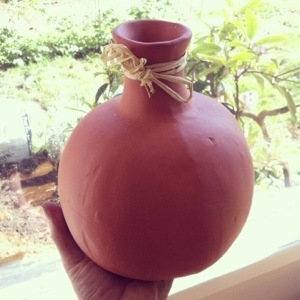 Wanted to keep things simple, with an eye on permaculture, I learned about a thing called “olla.” An olla is basically a terracotta vessel shaped like a pumpkin that gets buried up to its neck and filled with water. The water then slowly leaches into the ground, slowly watering your plants at root level. Placed correctly, ollas can adequately replace the need to water with a hose. I had a hard time finding them for purchase online but final found some and got four 1/2 gallon size to start in my 16sf raised beds. 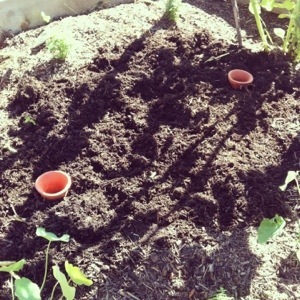 Here they are ready for when I plant my tomatoes. Marigolds and nasturtium are ready to go too.